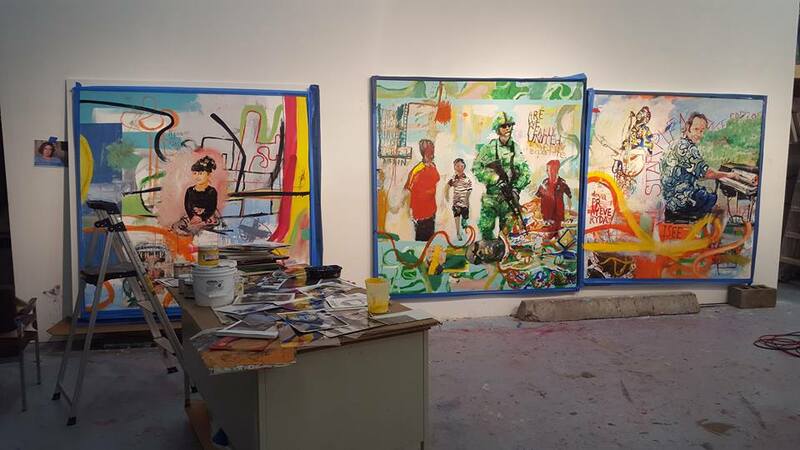 NEW YORK and LOS ANGELES – April 18, 2016 – NY-based artist William Quigley unveiled his first solo show in LA in over a decade on April 28 from 6-8pm. 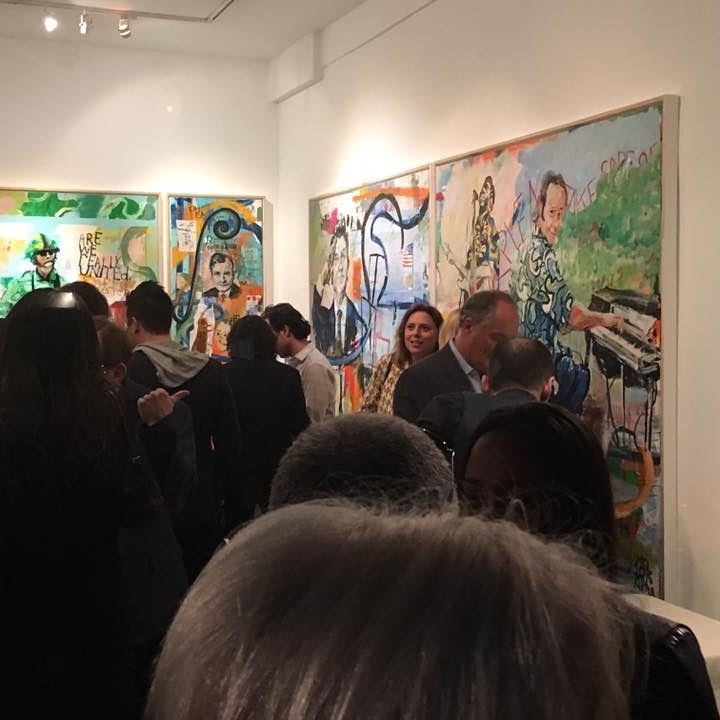 The opening was at Karl Hutter Fine Art at 9895 Santa Monica Boulevard in Beverly Hills, California. Quigley’s work has always tried to tackle both Figurative and Abstraction. Though best known for his portraits, he has made countless purely abstract works over the course of 30 years. 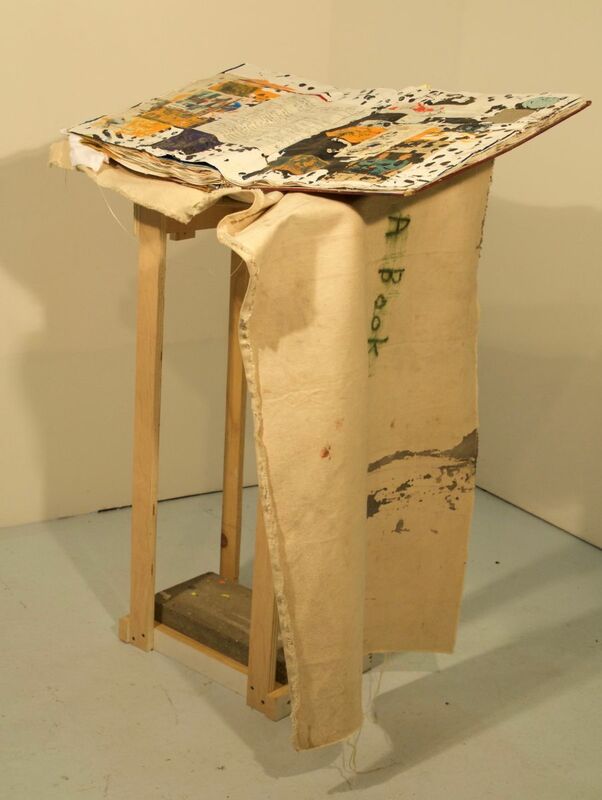 From 1980-1985, Quigley studied Art, History, and Film at Philadelphia College of Art, the University of Pennsylvania, and the Tyler School in Rome. His first exhibition, fresh out of Penn in 1985, was with Andy Warhol in Philadelphia at the gallery of famed collector Henry S. McNeil. 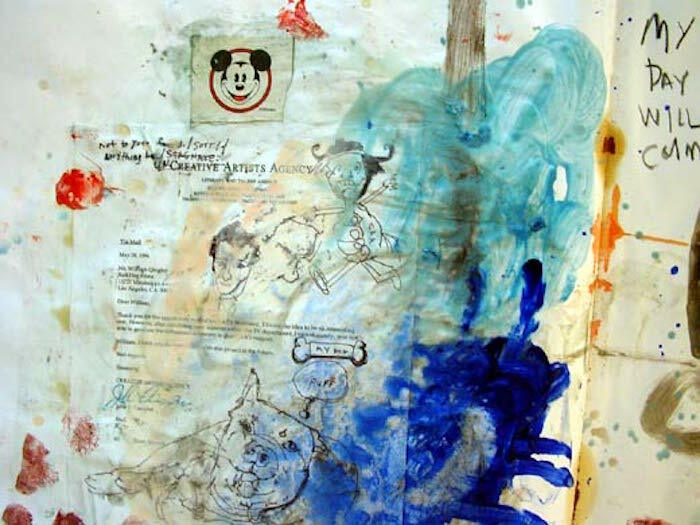 Quigley attended Columbia University Graduate School of the Arts in 1986 and moved to LA in 1989 after a series of group shows in NY. Quigley’s big break in LA came from Manny Silverman, who showed his work from 1989 to 1993. He was invited to to paint at the Miro Foundation in Mallorca, Spain in 1992 by way of the LA Art Fair and Galeria Ferran Cano, Miro’s dealer. 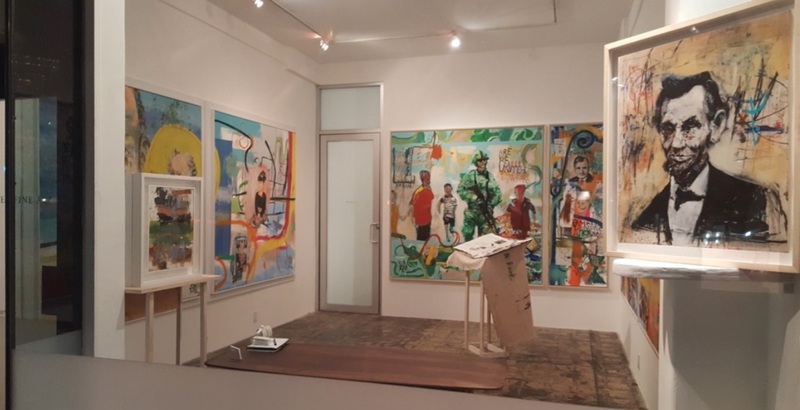 Cano brought Quigley to his first of three Art Basel exhibitions with Galeria Ferran Cano, where Basel founder, Ernst Beyeler, purchased three of 35 small works that were created in the back storage room of the Fair. Moving back to LA, he founded the renowned artist-run space Mayb/AB Gallery in 1994 with Pamela Armstrong and Director Dan Bernier. 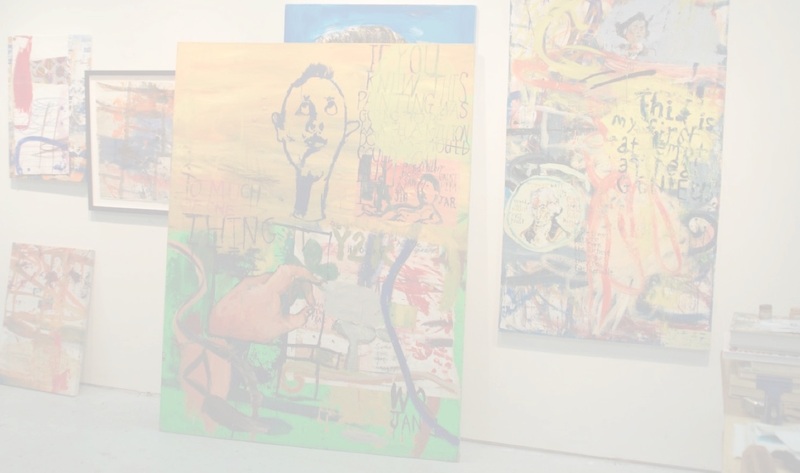 AB Gallery featured artists Marc Chiat, Steve Hurd, Manuel Ocampo, Dan Fisher, Martin Kersels, Russell Crotty, George Stoll, Jason Rhoades, Mike Bismuth and Kevin Sullivan, all of whom have become big names in the contemporary art world. Quigley ventured back to NY in 1999, set up a studio in Chelsea, and eventually moved to Soho where he spent 10 years in his infamous Soho loft. 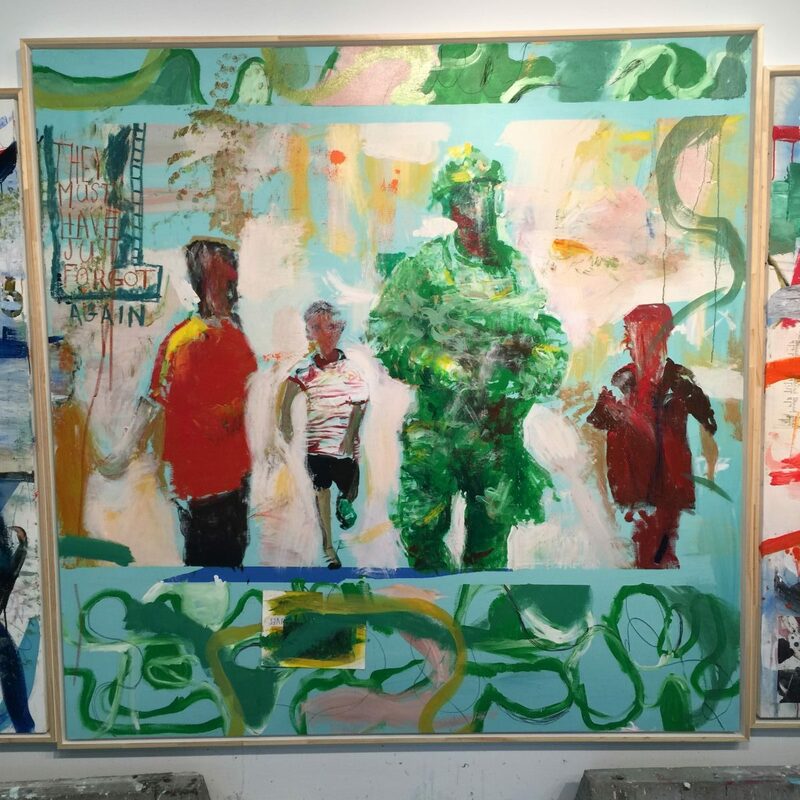 In the first decade of the 21st century he worked with German dealer Arne Zimmerman and painted commissions of former Presidents Bill Clinton and George W. Bush. 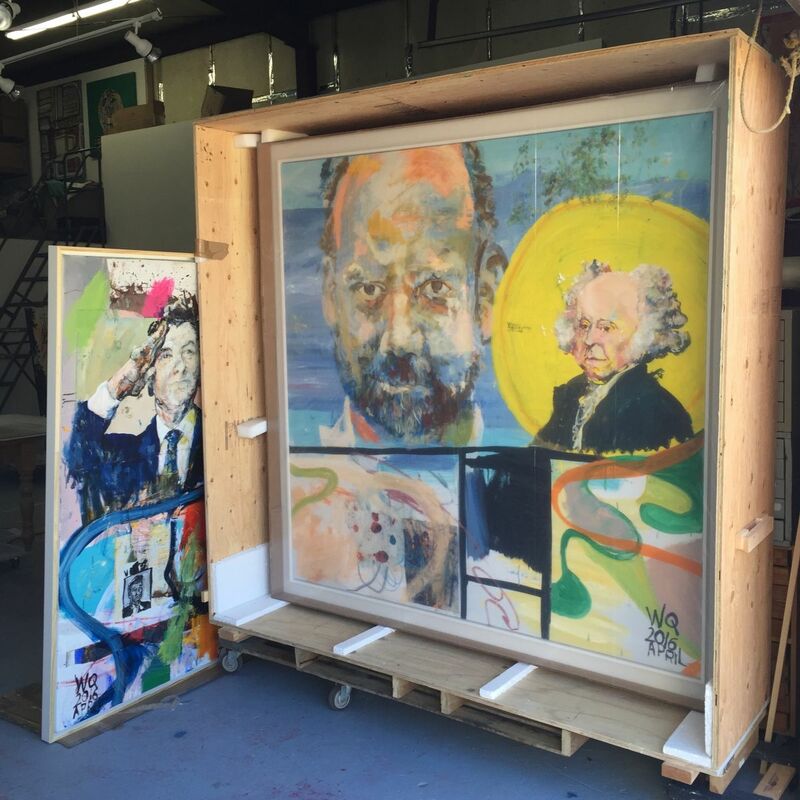 Karl Hutter is the first art dealer Quigley has worked with since 2006. 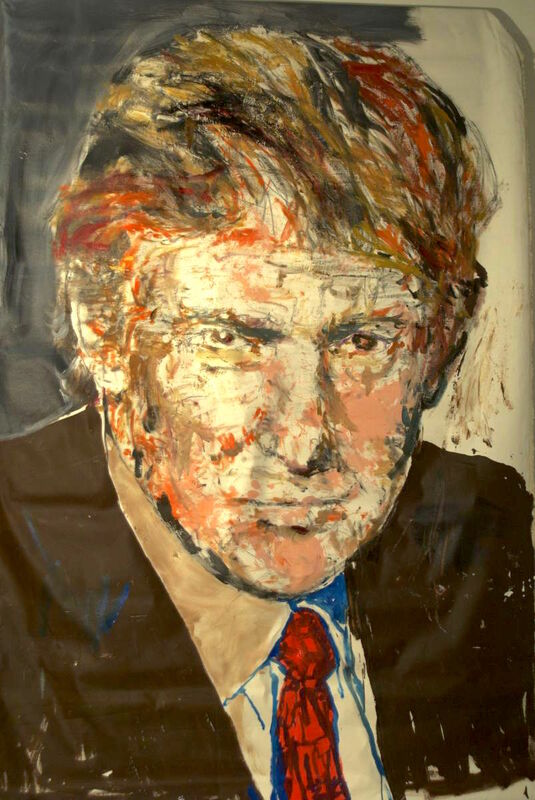 In 2006, recommended by his mother, Quigley painted an 8 ft portrait of Donald Trump. 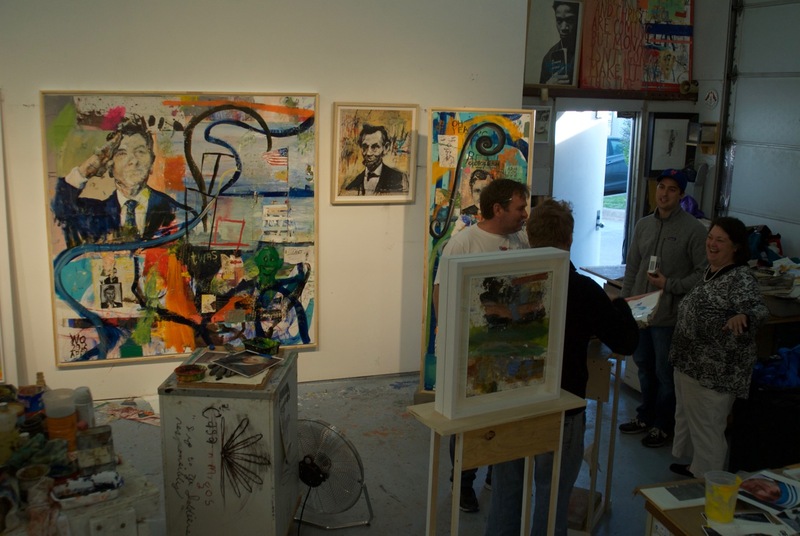 In 2013 he exhibited the painting at his solo show in East Hampton hoping to attract Mr. Trump by offering to donate part of the proceeds from the show to Talkhouse's Amagansett Soldier Ride and Guild Hall. Mr. Trump acquired the painting in an auction the night of the Opening long before announcing he was running for President 3 years later. In November 2016 became the 45th President of the United States. 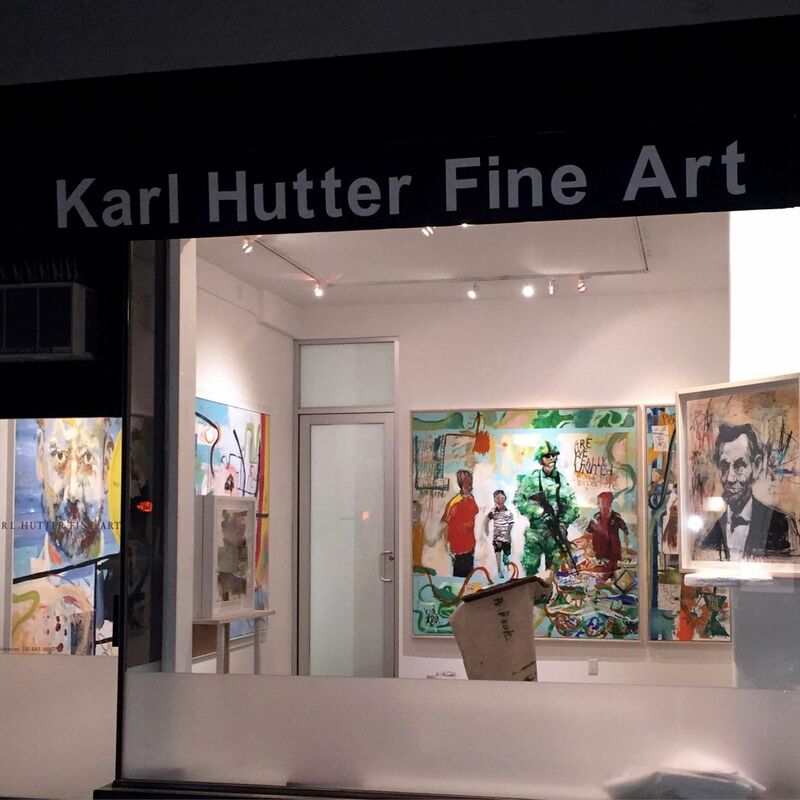 Karl Hutter Fine Art specializes in the exhibition and sale of paintings, works on paper and sculpture by American and international artists of the Modern, Post-War and Contemporary periods. The gallery has presented historically focused exhibitions featuring works by Francis Alÿs, Andy Warhol, Bruce Conner, Adolf Fleischmann, Jean-Michel Basquiat, Cy Twombly, Roy Lichtenstein and Claude Monet. 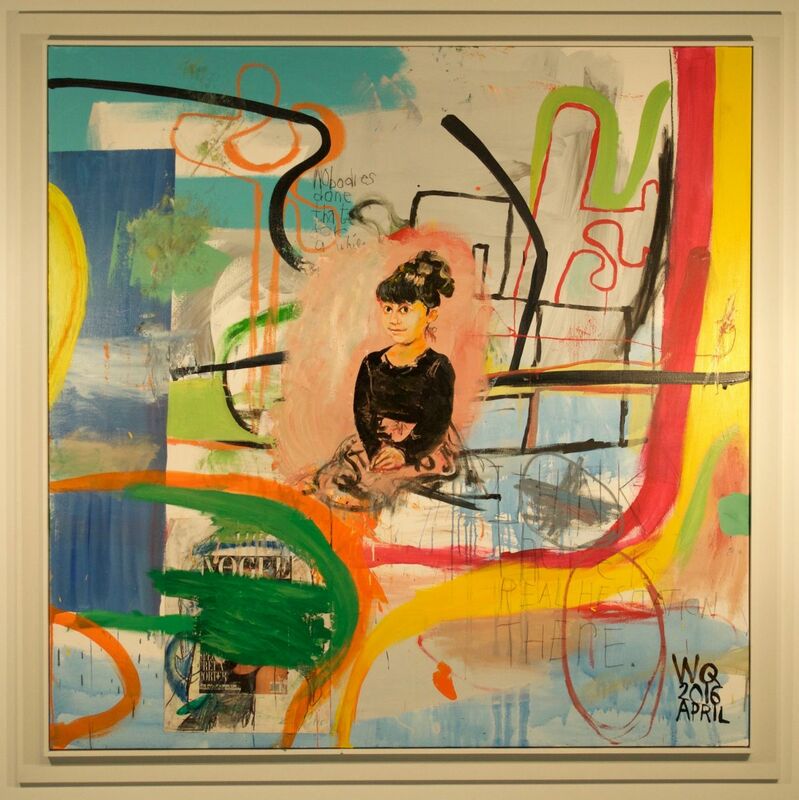 Other artists who have exhibited with Karl Hutter Fine Art include Aeryk, Florian Süssmayr, Dennis Koch, William Quigley, Christopher Makos, Chris Thorson, Jedd Novatt, Paul Solberg, Brian Wills and Miwa Ogasawara. The invitation is a photo shot right outside Quigley's studio. It depicts past works scattered randomly around the Industrial Oil Yard of Schenck Fuels, a 119 year old East Hampton Fuel Business. His studio is a former auto mechanics shop. "My father was in the auto parts business and we used to go around to his customers garages and deliver supplies. I feel very much at home here. And kind of amazed how full circle it all is." He views his work as conventional, yet assiduous, and is motivated when surrounded by people who "really hard for a living. It's very humbling to be able to paint in this environment. I feel privileged to be accepted and have the freedom to do what I do." He lived in Los Angeles from 1989 to 2000. 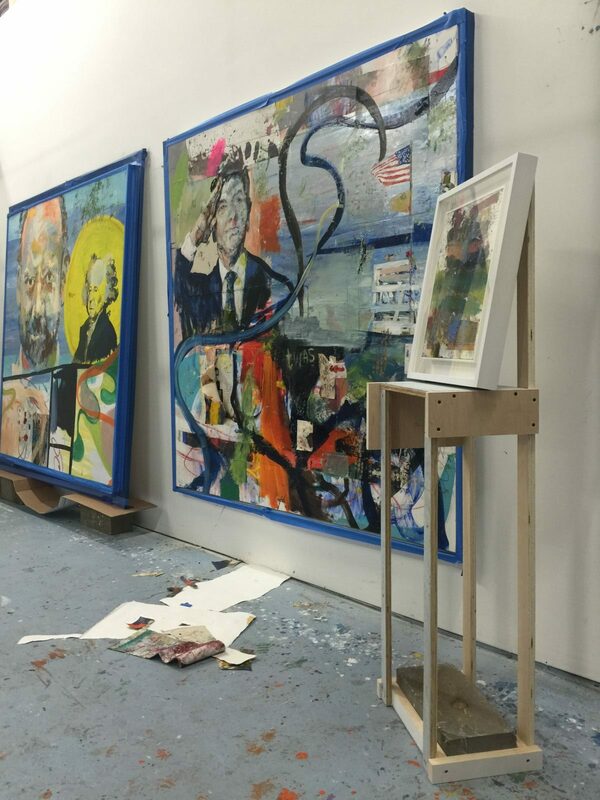 In December 2015 he met Karl Hutter at his partner Christophe Van de Weghe's booth in Art Basel Miami. 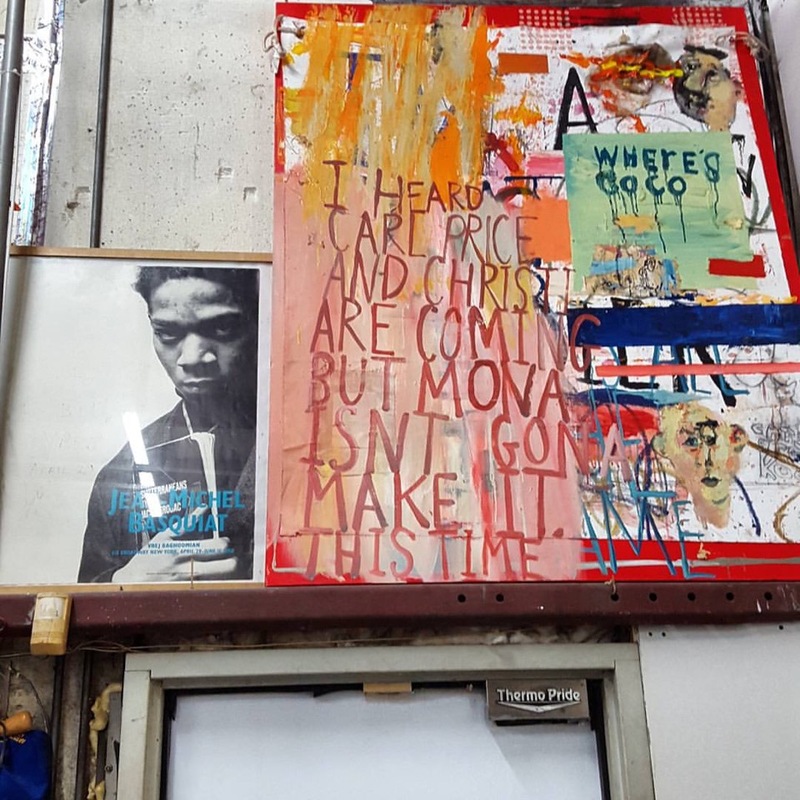 William's studio manager and framer Dan Meeks insisted Quigley look at a particular Basquiat frame in Van de Weghe's booth. 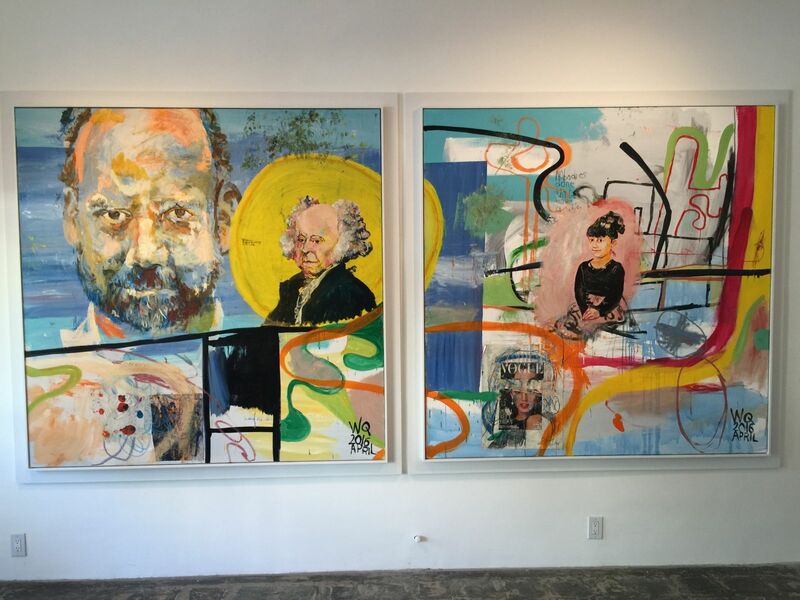 After talking for a few days, Karl offered a solo show at his Beverly Hills gallery on April 29th 2016. Quigley's birthday. It's his first Solo Exhibition in Los Angeles since 1999, when he moved back to New York City. 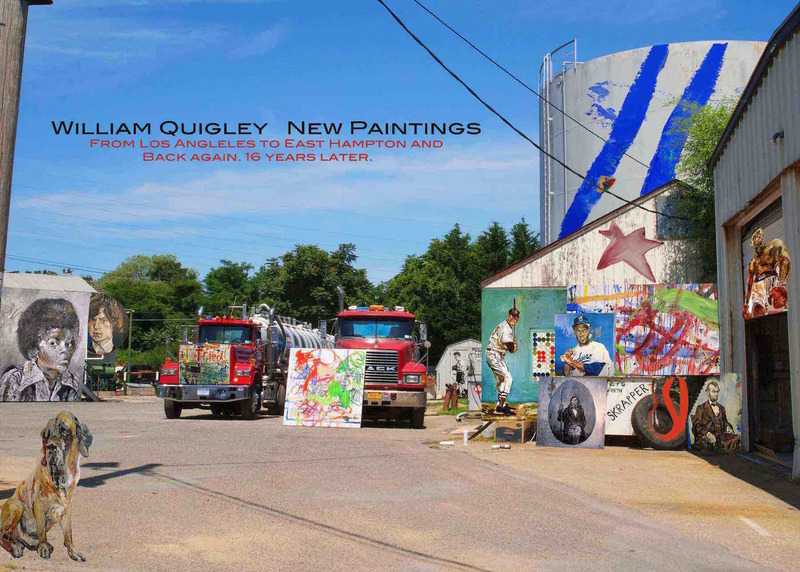 WILLIAM QUIGLEY From LA to East Hampton and Back Again. 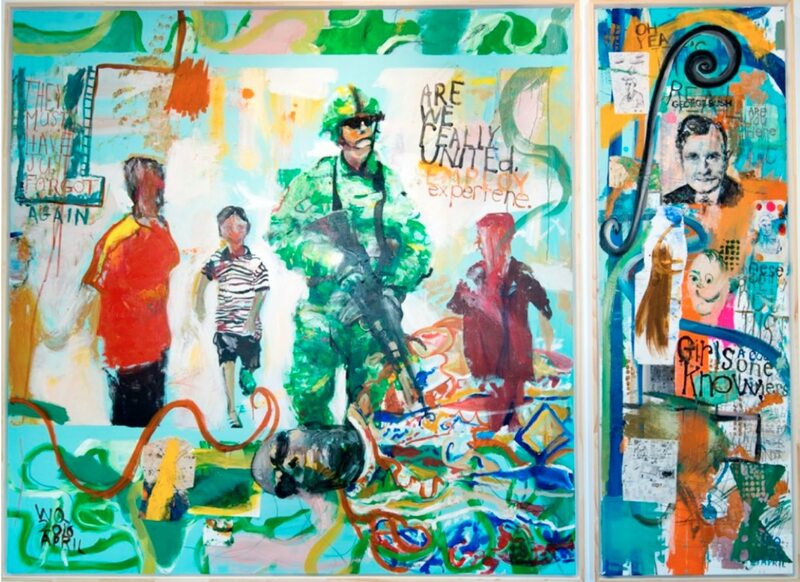 Quigley created 6 individual paintings he calls "panels" that combined for a 32 ft piece titled Are We United For the show he also created a Lincoln Print that he felt fit into the theme and political message of the Exhibit. Quigley met Karl Hutter in December 2015 through Christophe Van de Weghe Galley who had a beautiful booth at Art Basel Miami . 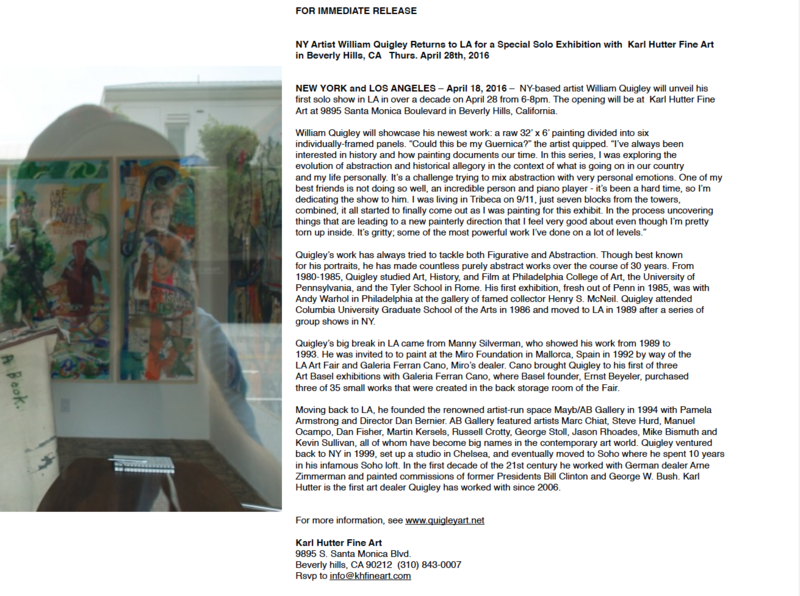 Karl offered William a show at his Beverly Hills gallery on the artists Birthday April 29th 2016. It was the first time Quigley would do a solo show in LA since moving to NY in 1999. 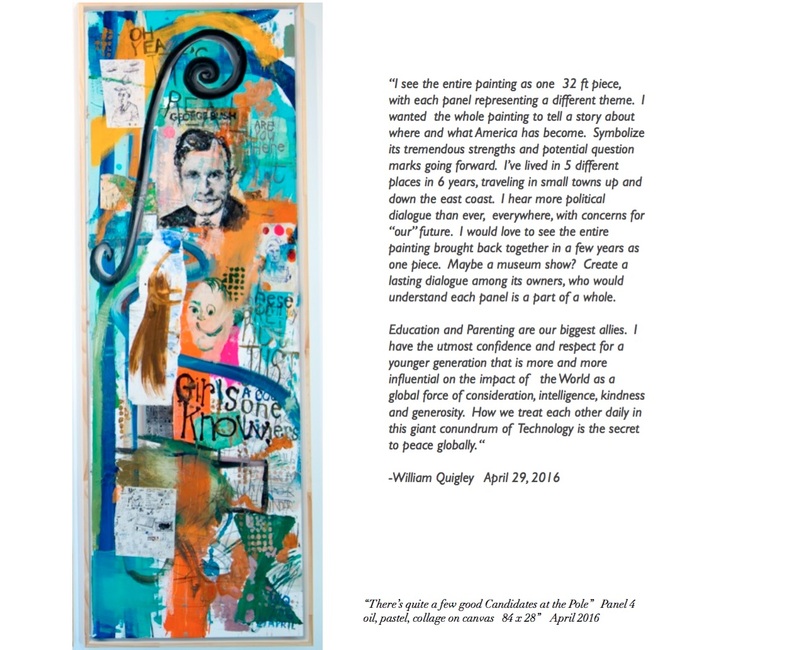 “I see the entire painting as one 32 ft piece, with each panel representing a different piece of the pie to the overall theme. I wanted the whole painting to be an artistic and historic interpretation of what I think America has become and things to consider going forward. April 28, 2016 Karl Hutter Fine Art Beverly Hills. 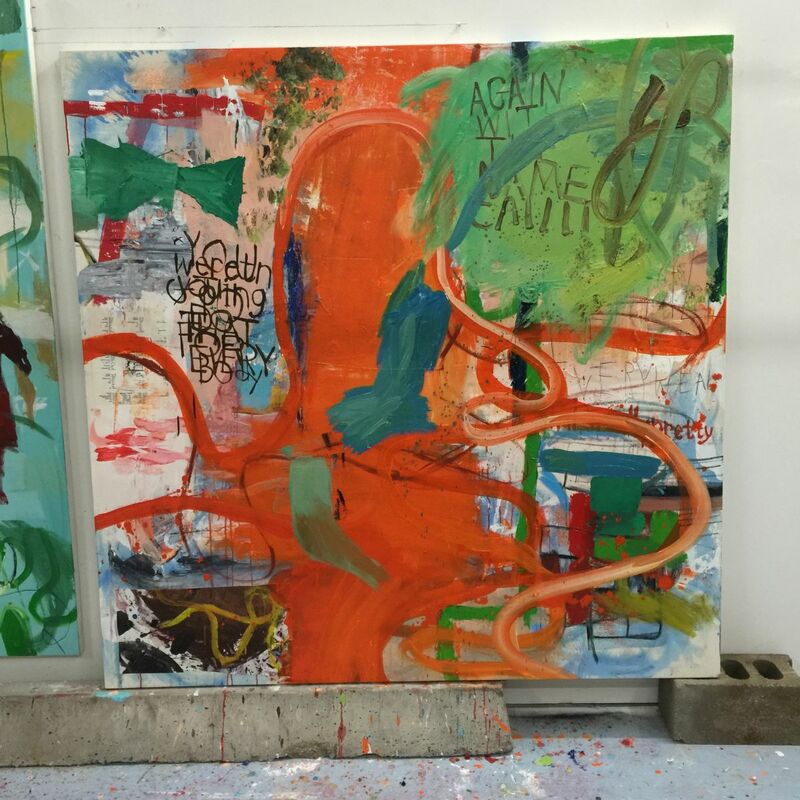 This painting is the first Panel of a 32 ft Painting divided into 5 Separate Paintings or Sections. Paul Giamatti played John Adams in 2008 based on the 2001 Pullitzer Prize winning biography by author David McCullough. 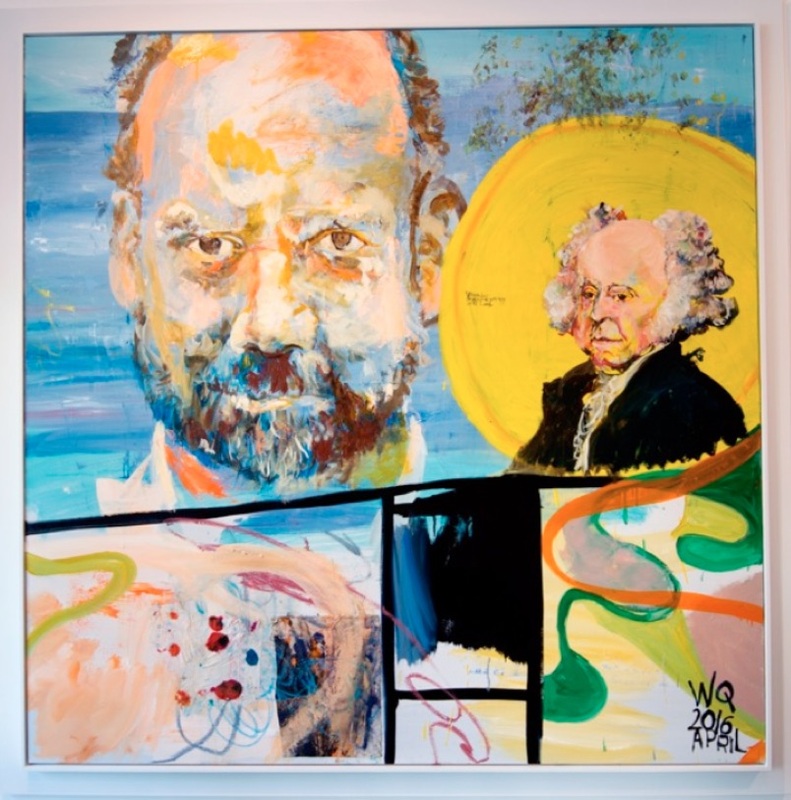 Both Adams and Giamatti are being used symbolically in the first Panel as two individuals who, through their focus and work parallel a cultural and political compassion for nostalgia and tradition. The broken up space, compartmentalized sections, and fluid lines break up the canvas into sections referencing influences like Martin Kippenberger, Roy Lichtenstein, Gary Stephan, Condo, DeKoonings late ribbon paintings, Brice Marden and John Singer Sargent. The divisions and comparisons in pallete, choice of color, line and form are also an attempt to unite both the figurative and abstract elements while referencing a trip through American art history. Giamatti and Adams evoke a similar aesthetic value and voice, embracing the challenges that were set in Our Constitution. The painting conveys a message that Adam's ideologies have to be reckoned with although the times and society have drastically changed. Through this portrait, Quigley further emphasizes that Giamatti's overall work, and not just his portrayal of Adams, attempts to uphold these formalities and morals in all his roles. His characters almost as if a high school coach in a small midwest town, lead and inspire through his conviction the guidelines passed down over 230+ years, as we set new standards for growth, independence and peace in very vulnerable times historically. Panel 1 of 6 individually framed Paintings. WOMEN OF TIME ARE NOT ALWAYS APPRECIATED ENOUGH. The second Panel and a very significant piece to the whole, the bold use of color and continuous flowing line signifies a homage to the underlining and at times often underestimated strength and stability of Women, who not only in our personal lives influence culture and politics. Its imperative in order to establish peace globally, that Men in high positions of power accept and embrace the opinion and experience Women have. How their voice as a whole may affect our conflicting worlds internationally. "I was really thinking about Lichtenstein alot and his strong use of color and almost religious process of layering images, yet wanted to add graffiti street like elements of scribble kind of like a child mixed in with the innocence and beauty maybe of a Matisse, Goya, Velasquez, Mary Cassat, Alice Neel, or Frida Khalo portrait. I was taught by Alice Neel and am always thinking of her stories and paintings. And love Hans Hoffman too, and the way he breaks up space. The frames again play are very strong role in each of these pieces. Almost making them sculptural like a Joseph Bueys , Cornell or even thinking of Rachel Whiteread. " 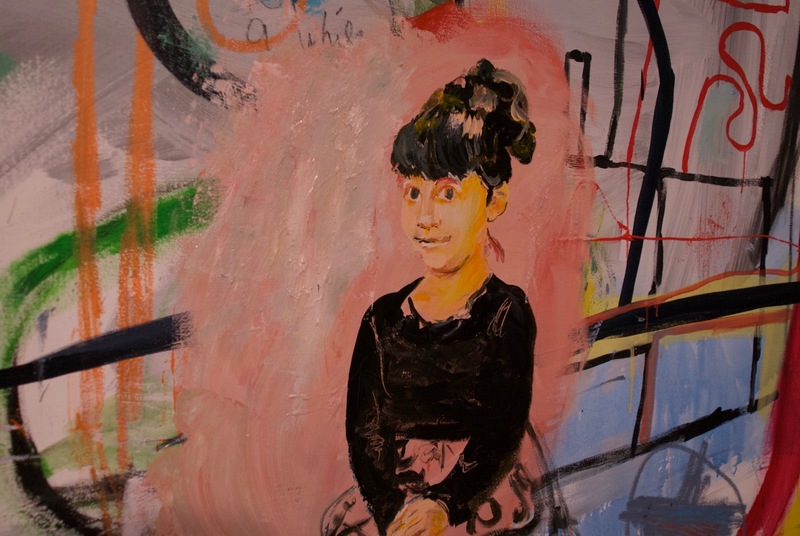 The main figure is Quigley's niece Samantha, who is 6 yrs old in the painting. Now 18, in college studying dance and biology in New York city. A 1986 Vogue magazine cover with Cindy Crawford is used as a both a metaphor and symbol how the objectificaton of women in our society has changed. The fact we now have a woman running for President for the first time in US history exemplifies Women with Power is now very much in Vogue. WHAT'S THE DEFINITION OF SERVE. AND DESERVE? "Here I was trying as much to break away from myself and my idea of art as I could. I kept thinking how abstract serving or even traveling to a place like Afghanistan or any war zone must be like. I wanted to pay honor to the soldiers while having sympathy for all the citizens who are just victims of war. Including the families of soldiers. The painting has so many references to Miro, Picasso, Picabia, Schnabel, Neo Rausch and a whole bunch of others. Yet at the same time It was trying to be on it's own. Like a soldier in a desert. Something I know little about but think about very often. God Bless all of us." This is the 3rd Panel and is again in honor of Staff Sargeant Marine Josh Krueger, founder of American Patriots Support Foundation. William was asked to research and paint Josh by a friend and local East Hampton policeman, Matthew Konchanasz, who put him in touch with Josh. Krueger entered active service in 1997. He served 2 UDP deployments with the First Battalion Fifth Marines, East Timor – Force Protection with First Battalion Fifth Marines, Egypt – Force Protection during Operation Birghtstar, and Iraq – Camp Fallujah. Josh was injured in Fallujah Iraq by a roadside bomb (IED) while conducting convoy operations II MEF FWD PSD in 2005. Josh was medically retired in 2006 and joined the private sector workforce in 2007 where he executed operations for a fire protection company consisting of $7.5 Million in revenue. Josh is married to his wife Jill and has two daughters. In many cases several Marines and Vets have said in many different words how they remember the faceless children wearing American and European Brand clothing. Notorious B.I.G. is used as a symbol in the bottom right hand part of the painting for peace. Stopping the senseless, violent crime on our own soil and uniting as ONE is a potential positive step and strong stance towards peace domestically and internationally. 2016 is a crucial year and election. 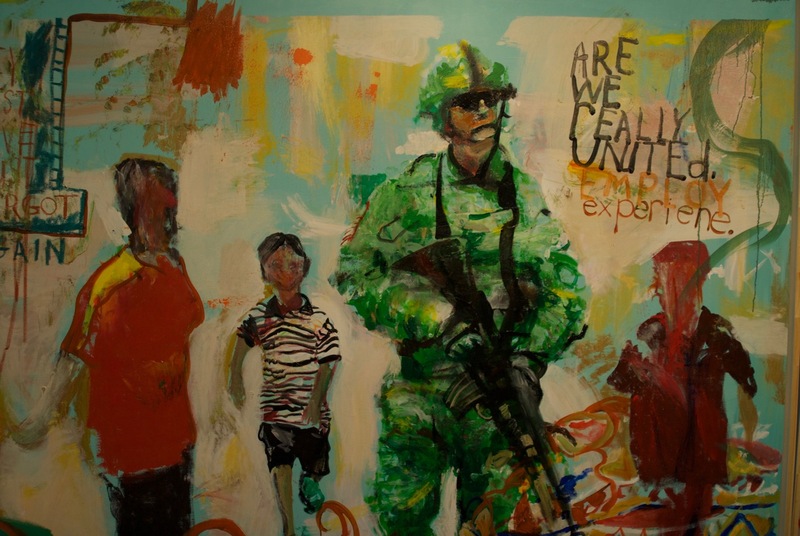 This painting the 4rth panel in the series studies our past history reflecting not only on how we arrived at our current position politically, but our need for caution and self governing by uniting our homes and communities going forward. Instead of so much division and unrest it's a time to Unify despite the politics, politicians and policies unraveling us with turmoil. Recognizing we are all Americans and not undivided by political polls. Making good decisions daily, consideration for others, respect for hard work, for all who honestly try to feed their families, and continuing to help others who may need a boost, is the core of our strength. Abusing others civil and rights to protection just destroys any chance of unity allowing an easy target for outside threats. WHAT'S YOUR INTERPRETATION OF HISTORY? The 5th Panel illustrates Ronald Reagan at the pinnacle of Capitalism. While President the United State's success internationally and domestically inflated the global economy while changing America's style of life and standards of living dramatically. As proud as America is, our hard work and strive for personal economic glory may be, if not put in perspective, our downfall. The cubistic layering, map like terrain and word 'Twas' and continuous abstract lines of Blue and Red try to unite the entirety of the painting, and put in perspective a lineage of free flowing pride like an arial map view. The life guard stand with the American flag directly symbolizes the ever growing need to protect our borders while still being open to those in need. There is a 1986 drawing of Ronald Reagan Quigley did in college collaged below the larger portrait. The green cartoonish head is a symbol of Commerce. Reagan the 40th President of the United States from 1981 to 1989. He was the 33rd Governor of California from 1967 to 1975, following a career as a Hollywood actor and union leader. Leaving office in 1989, Reagan held an approval rating of 68%, matching those of Franklin D. Roosevelt, and later Bill Clinton, as the highest ratings for departing presidents in the modern era. While in office the America Flag flew proudly as one of the greatest countries in the world. PAUL TILLOTSON. THE PIANO FELLER. A MUSICAL GENIUS. HE LEAVES US ALL WIGGLIN, WITH BIG, HUGE BALLS. "What does it all mean in the End other than the art, love, good times, health, growth, friendships, memories, how well you are treated and how well you are loved is a reflection of how well you treat others.. I met Paul Tillotson in 1999 through Sherman and Ray Foote of BigFoote Music. In March 2016 smack dag in the middle of painting for this show I was told Paul had a short time left and to come to Idaho soon if I wanted to pay my respects to one of my dearest friends. I told Paul about the show, and he said do the show. Crying inside but trying to show strength I revealed I was dedicating this show to him. I think it made him very very happy considering the circumstances. I started painting in April 2016 as the final piece to the puzzle, knowing he had only a few days or weeks to live. I was praying every minute hoping that after the April show Paul would still be alive. The guilt was unbearable at times but I never let on. We talked often and texted almost daily. I arrived in Sun Valley early May and stayed a month spending hours with Paul and his family. Paul had dinner cooked every night for him by so many neighbors, friends and people that never met him in Sun Valley for the last 2 years of his life. Again an indication of who he was and how much his music means to the community. Even in his worst days he seemed to inspire greatness and strength. He is, always was, and will be gift from another planet that so many of us can learn from and find peace with. We spent so many days and nights together I lost count. He is one of the greatest persons, friends, and artists I ever met. He would wear the most bizarre clothes everyday full of color whether it was 90 in July or 8 degrees in January. 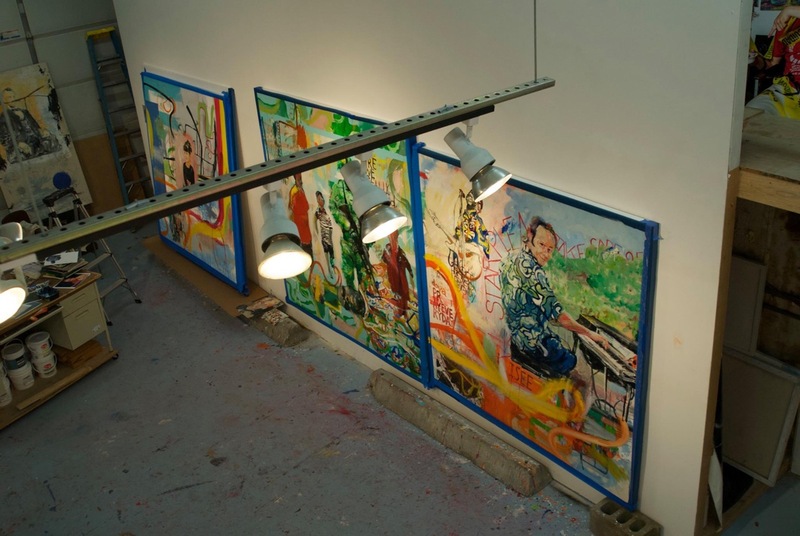 I was asked to create a mural at Electric Lady Studios the home of Jimi Hendrix a few years ago. I was so overwhelmed I cant even finish it. I never met Hendrix yet know he was incredible. I knew Paul really well and never underestimated or once for a second thought there was another living piano player I met who could play with the energy Paul had. He was my Hendrix on a keyboard." Created in 1996 in 16 days, the fourth of seven hand made thematic books that Quigley has continued to make at every step of his career. A 90+ page book, with each page a painting telling a story, became a centerpiece and elaborate compliment to the Civil War paintings shown at the Lawrence Gallery in 1996. The book's gritty design incorporates war documentation, random notes, nostalgic battlefield photos and contemporary art world tales illustrating one of the most complex and misunderstood wars in American History. 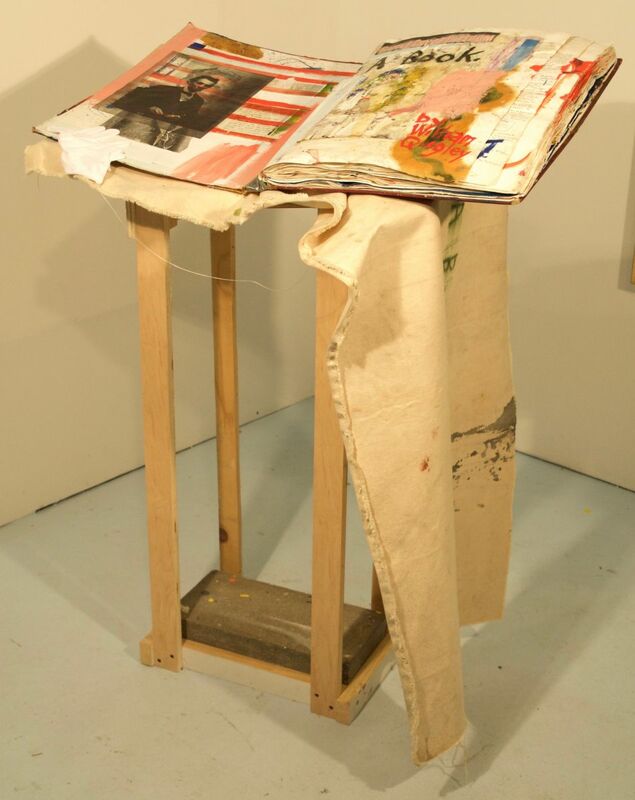 The Book is equiped with a standing wood pedestal frame created by Daniel Meeks, owner of Borders Picture Framing, East Hampton. 50"x 30" x 18"
It's a very Competitive Arena. Who's in the Competition Again? 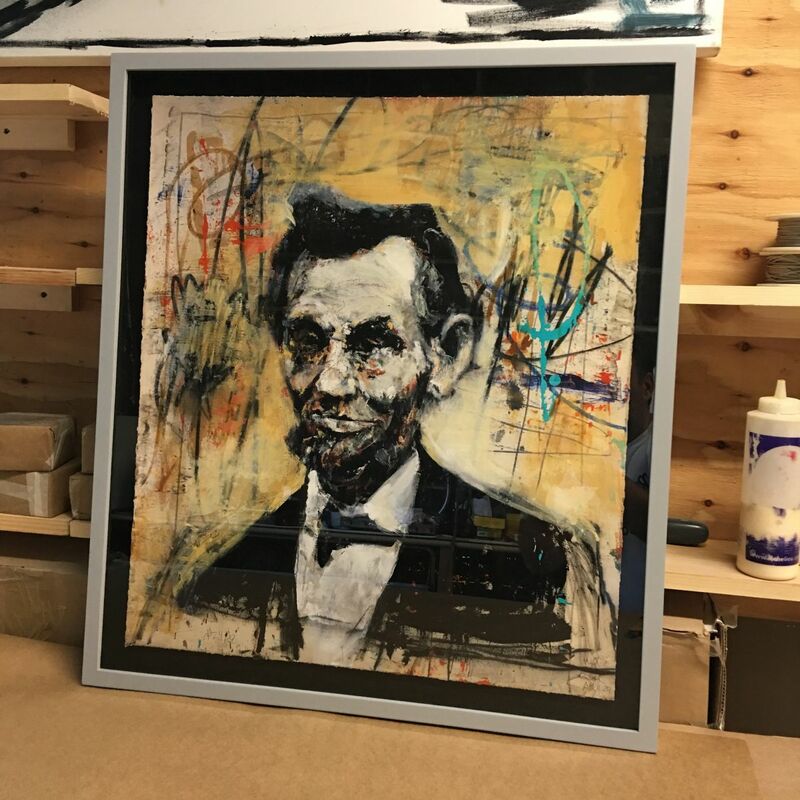 Since 1986 Quigley made 9 paintings of President Abraham Lincoln. 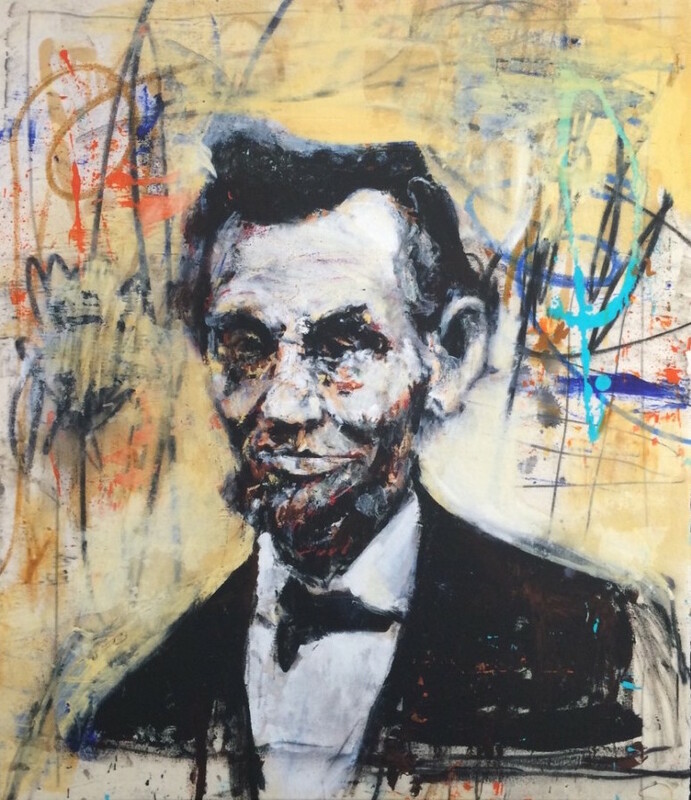 From 2011-213 he painted at The Bradford Mill Wheelhouse in Concord, MA, creating 2 of the 9 Lincoln paintings. 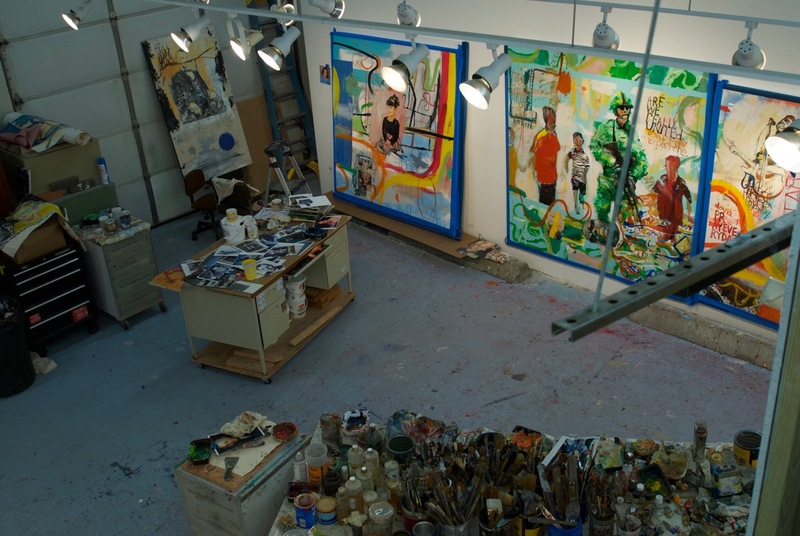 His second floor studio was located in a space called ArtScape, a small but integral part of the 1905 historic landmark, renovated in 2011 by John and Johanna Boynton. The couple purchased his 6th Lincoln portrait and quite a few other paintings created during his tenure at the Mill. 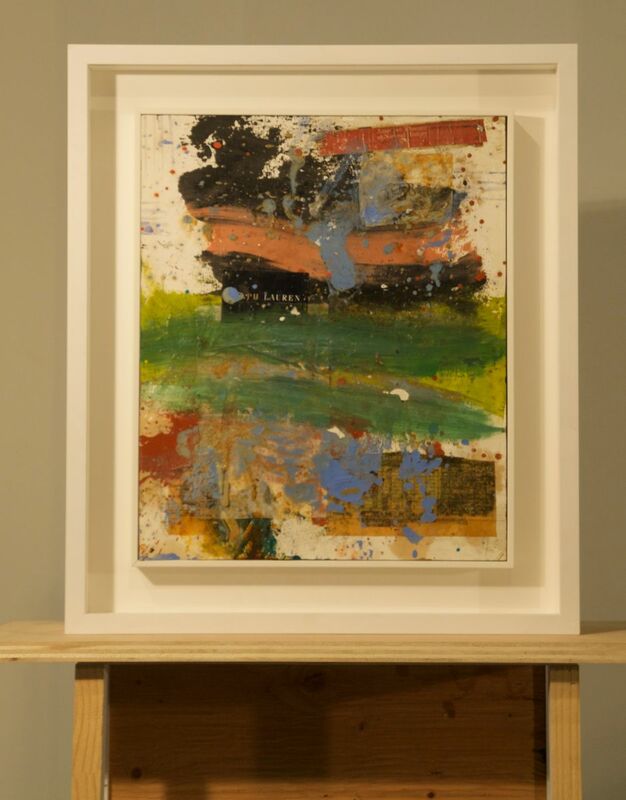 The painting again strongly illustrates Quigley's on going interest in combining abstraction and the vigor of Twombly or Pollock with the figurative discipline of Goya, Picasso, Bacon or Lucien Freud. While working on Lincoln #6 , he met and talked at length with Pulitzer Prize winning author Doris Kearns Goodwin, a Concord resident who wrote Team of Rivals and was working on the screenplay for the Oscar winning Steven Spielberg film Lincoln. John Boynton is now Quigley's business manager. Lincoln was the first Republican President. 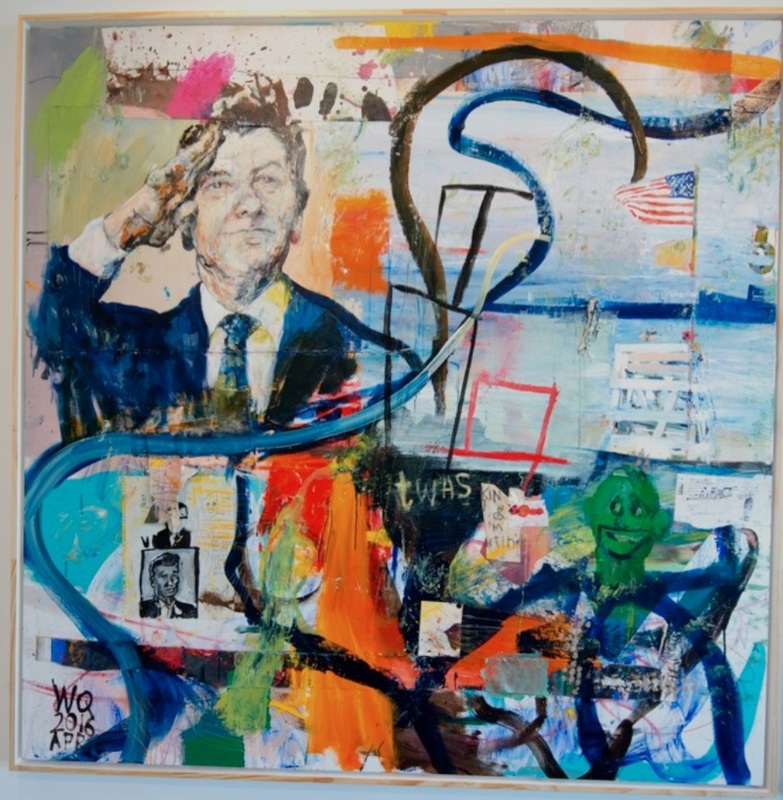 In 2013 Quigley created a Litho with artist Ben Moon and used the Print for an invitation to their first collaborative East Hampton Show together entitled, The Pleasurists Quigley had painted a 9 ft portrait of Donald Trump in 2006. 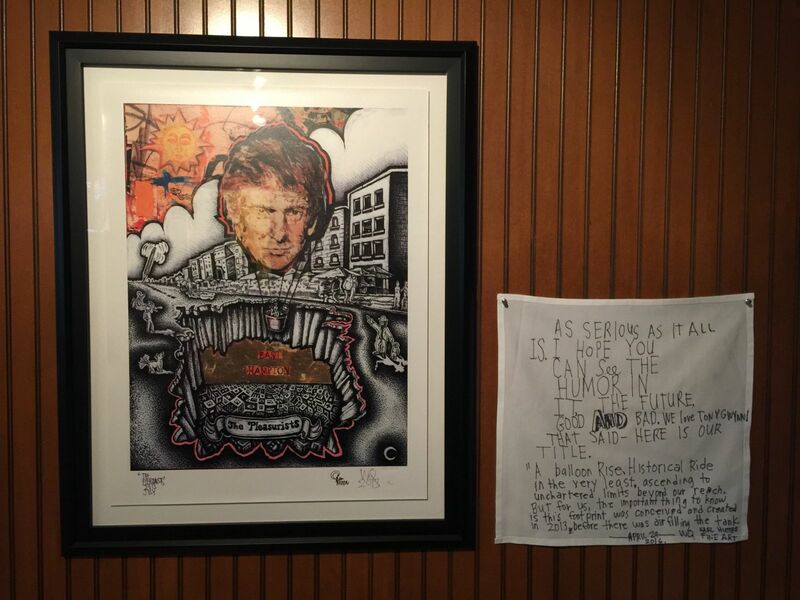 The show was hoping to attract the Real Estate Mogul by offering to donate part of the proceeds from the Painting to Soldier Ride and Guild Hall Mr. Trump purchased the painting in an auction the night of the Opening long before announcing he was running for President. Beverly Hills April 2016. Shot by David Levin. All frames by Dan Meeks. #BordersPictureFraming East Hampton. Dear Friend David Levin shooting the paintings and Opening. "I always start off listening to lots of music, Rolling Stones, Paul Tillotson, Pete Francis. Lots of Rap, Jazz and Coldplay etc. What better thing to do is listen to others art, music as I try to make my own. 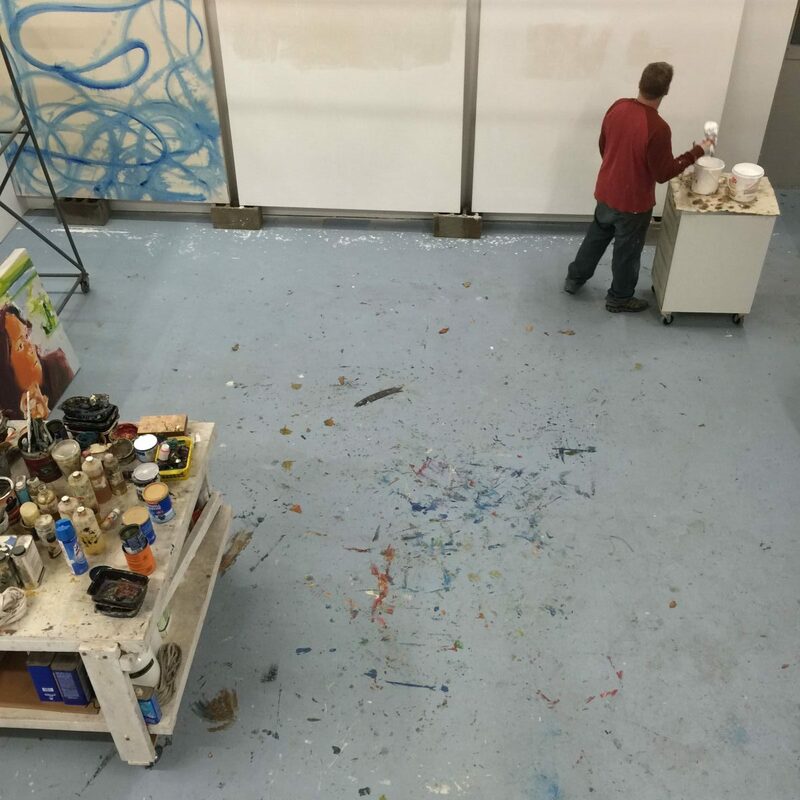 Once the studio gets into a rythm i begin each canvas as if painting a street mural or thinking about my heroes like Twombly, DeKooning, Kline or Miro. Eventually I get lost and the paintings become about what they are, or what's going on inside them. The world kind of stops. I don't have any windows in the new studio. So I feel totally kind of disconnected to the nature, ocean and elements around outside. The internet connects us all....kind of... and that false feeling of being in touch is what these paintings were all about. I wanted these paintings to be both responsible and vulnerable, subject to criticism. Not art, or art critics so much, but more telling a story about the times we are in currently, 2016, and moving forward. There's way too much crime." 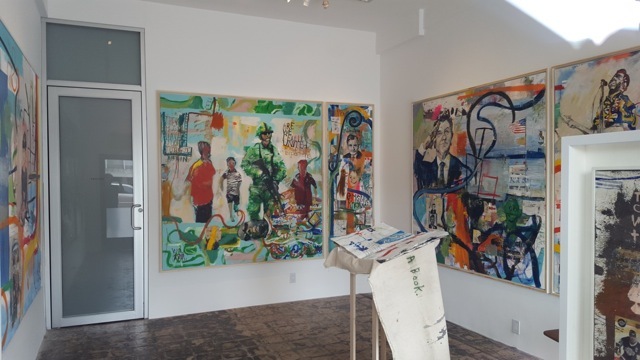 Meeks is located in East Hampton, NY working with many artists, collectors, galleries and museums for 30 years. He frames all of Quigley's works, while helping manage his studio. 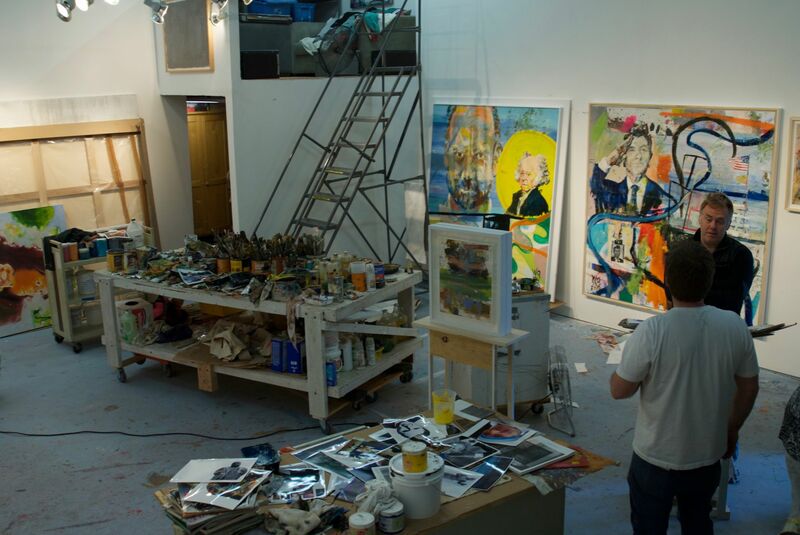 East Hampton Studio Making the paintings in February 2016. "Painting is really chemistry. Mixing all the right ingredients to get the surface and look you want. I use this table like a scientist would. Having all the tools and elements to mix the formula. Oil paint is remarkable. Nothing else like it. Acrylic is developing so fast, but still feels to me a little plastic and flat. The translucency of oil is something that is orgasmic when it flows. 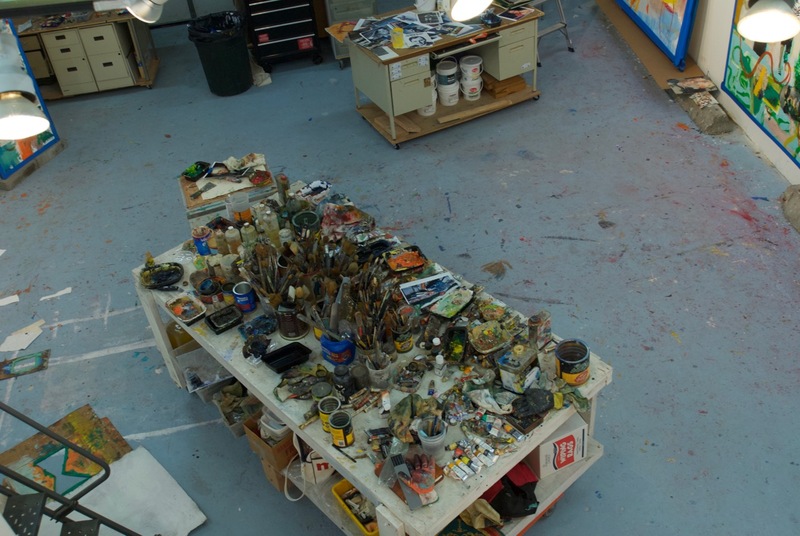 I always remember an artist's studio table, like seeing Bacon's Reece Mews studio redone in Dublin's Hugh Lane was a high, high point in my life. Quite a few of the teachers I had Neil Welliver, Doris Staffel, Joan Wilson, Peter Plagens, Tom Butter, Louise Fishman, Mark Tansey, David Salle, Gary Stephan, Ross Bleckner, Christopher Wilmarth, Alice Neel, Clement Greenberg and Darby Bannard, really upheld the old school tradition of action painting. And later some of the artists I was lucky enough to show with or met like Warhol, Julian Schnabel, Richard Prince, Albert Oehlen, Basquiat, Emerson Woelfer, Ruscha, Mike Kelley, Joe Goode, Rauschenberg, Steve Hurd, Marc Chiat, DeKooning added a new dimension in mark making and literal content that made me start questioning pure abstraction. Seeing Pollock's studio, and DeKooning's East Hampton Studio was almost like going to the Vatican and a lot of the reason I went out East." The evolution of the Paul Tillotson painting. "I thought about making the whole show Abstract. There is so much information today to pull from. Painting has become more difficult to break out of old molds. I get so attracted to the littlest marks made on an unfinished canvas. Each of the paintings could have made for very ambitious abstract paintings. Layered with lots of emotion and referential elements making up color fields that appear figurative, something that I find fascinating and fulfilling. Kind of like Guston's early paintings from the 50s. So many works I see today are not that interesting. The level of mediocrity being mistaken for brilliance is overwhelming. Even art dealers talk in broken links with little eagerness for anything but the "market". Im happy to be away from it all. Today someone will ask, 'What auctions have you been in?' I respond, 'Very few, my collectors actually like my work. And don't want to sell it because everyone feels there's no established market and I'm NOT QUITE THERE yet commercially. Quite a few of my friends who own lots of works say all the time they would not sell the paintings they own for less than half a million. Several times I heard by pretty successful people who are my collectors that paintings will be worth a million dollars, and I haven't even done a museum show. Shaquille Oneal even quoted a million. So I guess that means something. I'm just trying to make the next piece good and hoping they are appreciated as time moves on. " "Paul was dying and I knew it. We all knew it. He fought since 2011, and with Paul always the optimist, all his friends were miraculously marveled at his faith, and strength. He has an amazing family and saint for a mother and wife. I've known his wife, Janie since they first met on a brooklyn rooftop. Now they have two beautiful daughters, Charlotte and Lilia. Mildred his mother and the rest of his incredible family are as down to earth as any family could be. Part of Paul's originality and humility came out of the strong bond and connection to his Idaho roots and family. It's what attracted us to him. It's who he was. I tried to convey his LOVE and color for life, and dedication to how he saw the world. He never showed his struggle. It's amazing what he accomplished as a musician without too much money or support other than what he made playing gigs almost every night for near 30 years. He was like Tom Brady, quarterbacking a room like no one else I ever watched play. He put you on his back and led you on an amazing rollercoaster of emotion and sound night in and night out. I think the painting is one of the greatest and hardest I ever made. I don't even think I painted it. It was cold, freezing outside, and dark inside...yet I plowed through this last painting and knew the show would come together through the soul that was in this piece. In March Paul was given a few days by the doctors. I thought I would never see Paul again, and tried to cancel the show with an overwhelming feeling of emptiness, sadness and regret. After speaking to him in mid March, he insisted I do the show. Hearing this gave me superhuman energy, praying he would somehow live long enough or even through some divine intervention survive. I more than went through the motions. After years of wiggling to, or watching Paul play with the vigor and endurance of an aerobics instructor for hours when even the audience was worn out, I was able to dig deep and persevere. I wanted this painting to reflect the power of memory and spirit of real religion regardless of what one practices. I guess the prayers and wishes partly came true. Paul survived near 3 months after he was given 3 days. After the show went up on my April 29 birthday I flew to Idaho. We spent an incredible time for a month in Sun Valley with his family and dear friends. Art has it's own faith." 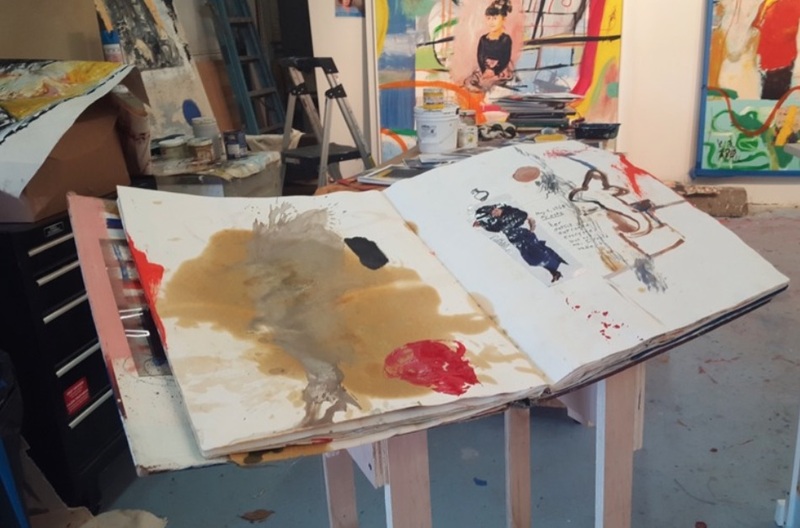 East Hampton Studio March 2016. The entire show at Karl Hutter was dedicated to Piano Player and dear dear friend Paul, Paulie T, Tillotson, who fought 5, (2011-2016), beautiful yet rough years battling colon cancer. 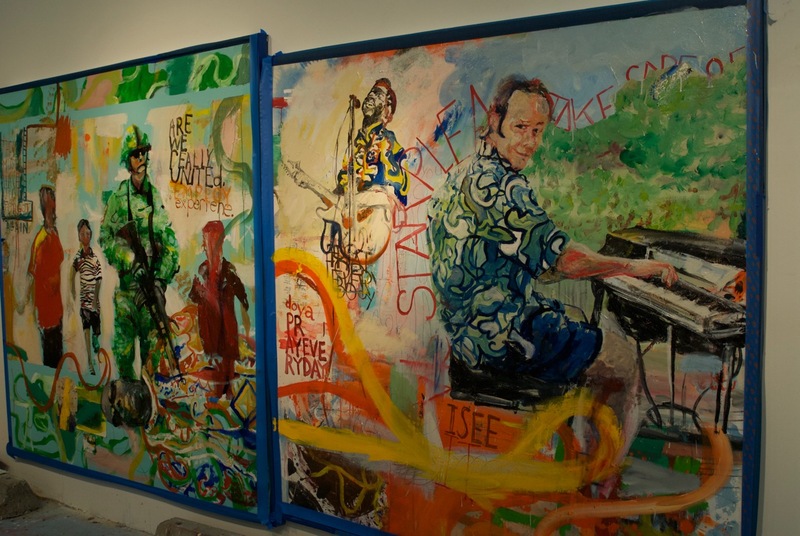 In 1999 Quigley was commissioned by the Foote brothers, musicians Ray and Sherman, to create a painting for the entrance to Big Foote, one of the most successful commercial music houses in the advertising world. 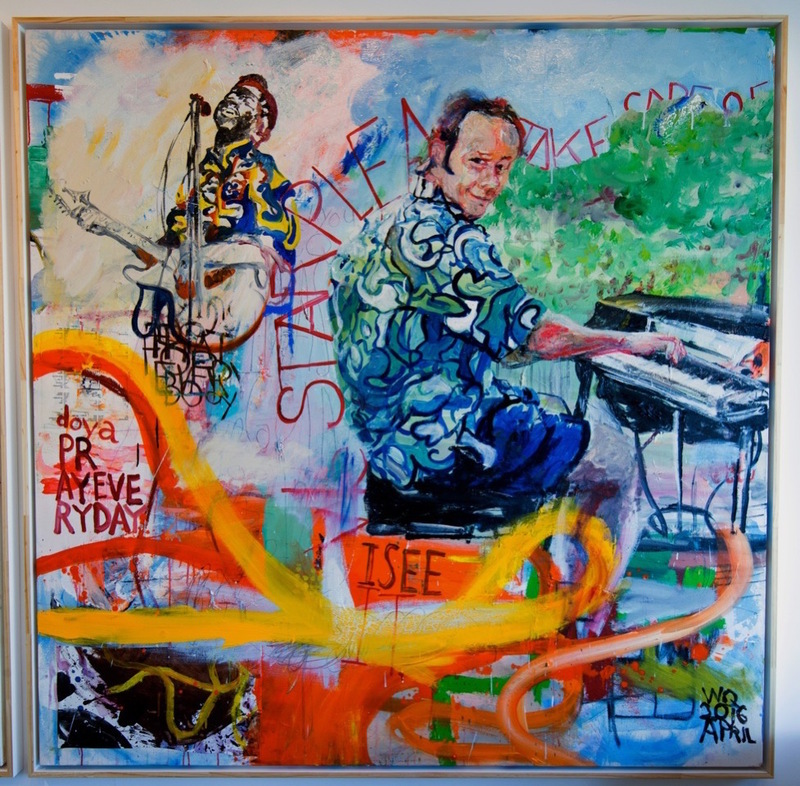 After finishing the painting, Sherman, also a phenomenal piano player, and Quigley celebrated by treating themselves to see one of Footes closest friends and fellow musician Paul Tillotson at Luxia on 48th and 8th Ave. Foote noted in advance that "We are going to have a rare old school NY Night", and see what he thought was "one of the greatest piano and jazz trios, James Wormworth and Mikey Merritt, of our generation play live". "When you walk in go right to the bar and ask for the bartender for 2 Watermelon martinis". Rarely does an introduction like that ever meet the expectations. That night began friendships that changed all their lives, leading to many, many days and nights of amazing times, hundreds of gigs in private lofts, jam sessions and incredible live shows. Paul played gigs almost every night of his 20 year career in the New York City, Boise and Sun Valley Idaho Jazz Scene, playing with an extraordinary amount of talent from all over the US. In 1996 he took over for piano great Gene Harris as head musician at the Sun Valley Duchin Room and Sun Valley Jazz Fest performing all over Idaho. Quigley spent many amazing days and nights with Paul and his wife Jane in NYC. In 1999 he introduced Paul to Pete Francis, the founder of the band Dispatch. Soon after Paul and Pete were making records and playing shows with Dispatch and the Pete Francis Band. Along with Marc Chiat and Eric Heimbold he helped design 3 of his albums, featuring The Love Trio, bass player Mike Merritt and Drummer James Wormworth, Funky Good Time, Lindy Hop Blues Live, and Tequila Time produced by Pete Francis and Skrapper Records. Paul is a legend, taught by the legendary Gene Harris. He was one of the most gifted musicians and greatest friend a person could hope to encounter in their lifetime. His love for his family, friends, and passion for life and music was unprecedented. To hear and learn more we encourage you to visit www.paultillotson.com often! 2 weeks before Shipping from NY to LA. 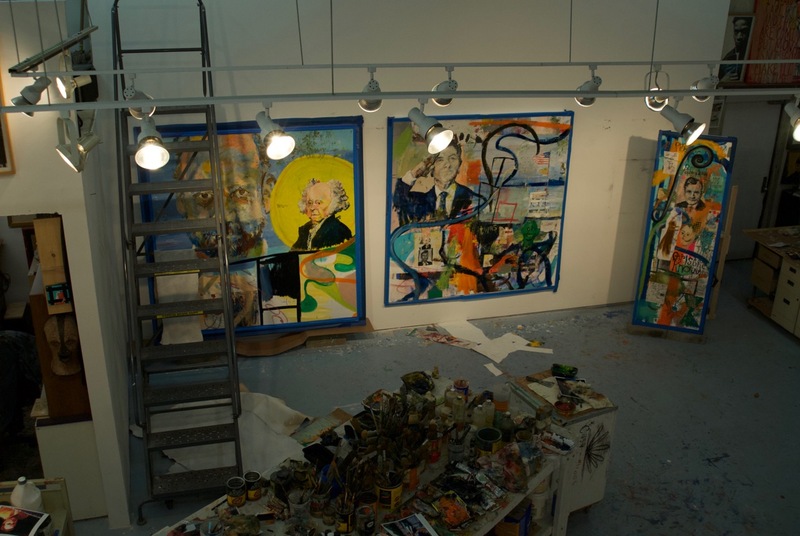 Inside the East Hampton Studio. Detail of Serve and Deserve East Hampton Studio 2016. In December 2015 Karl Hutter offered William a show in LA. 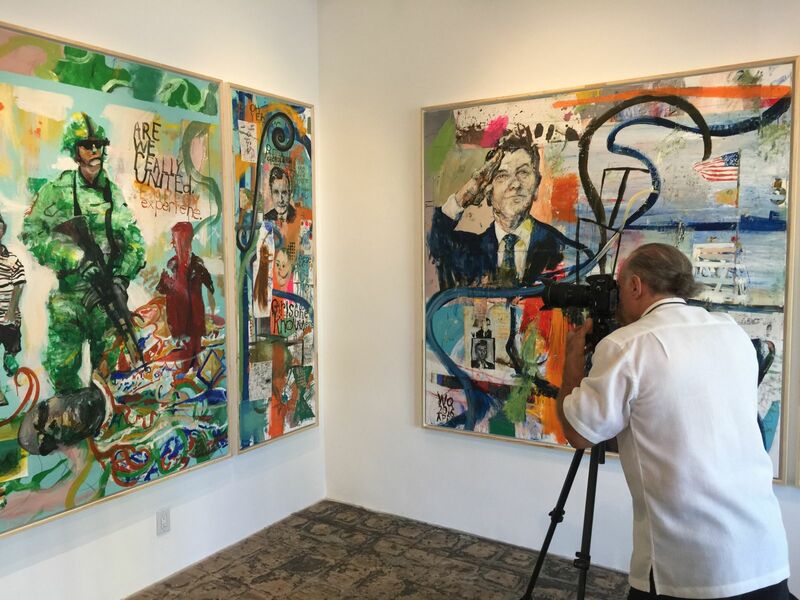 After visiting the space, he and Daniel Meeks, owner of BordersPictureFraming in East Hampton and Miami recreated the Gallery dimensions, sizing the entire painting to fit snugly into the Beverly Hills Space. "I kind of see it like Walter Di Maria's Broken Kilometer 1979 piece. (which has been kept in tact on West Broadway in NY since 1979) I wanted the whole painting to tell a story. Because of the economics and size I can see it being broken up, and each piece separately. But would love for an institution to bring it all back together one day, and show it as a whole. Hopefully, the US will also still be going strong. There's about 100 pages in the Civil War book. Created in about 17 days from September 26, 1996, to October 13, 1996 Civil War Show at David Lawrence Gallery 1996 in Beverly Hills. "It was an incredible Journey and battle making this book. Although there are so many exciting pages more about making art, having fun and being experimental, while thinking a lot about history, the Show was another overall commentary on the continued violence that plagues the United States. I tried to veil the seriousness and concern with lots of letters, collages, facts, images all written like a little kid to show the importance expression has. How one conveys a message, it's application can have an affect on how the overall message is being read. Every night in some major city and now even surrounding cities there is more crime and hardship than we need. Imagine if we all somehow were able to really try and Unite as One how powerful this country could be.? The book is 20 years old and still focused on the same theme, which at the time was reflecting on 1860." This is a detail in the Painting What’s the definition of Serve? And Deserve?Quigley states the reason for the painting was: "For years I have been trying to preach peace. Not only all the senseless crime in a Nation that should be supporting each other. Especially now. But also Living in Tribeca NY, 7 blocks from 9/11 in 2001 when the World Trade Centers were hit. And living in Los Angeles, celebrating his birthday April 29, 1992 when the LA Riots escalated right outside his studio walls. Both were like war zones. "Finally hit me"
The painting questions our own violence and crime daily in the US. The soldier in the painting is a Marine from Texas, who did 3 tours in the Middle East, and wanted to remain unnamed. Quigley tries to support Soldier Ride , Wounded Warrior Project and other VET oriented charities through his work. The Marine stated in a phone conversation, "how he remembers the faceless children wearing American Brand clothing running all over the streets of Afghanistan. We didnt know if they were good or bad kids." 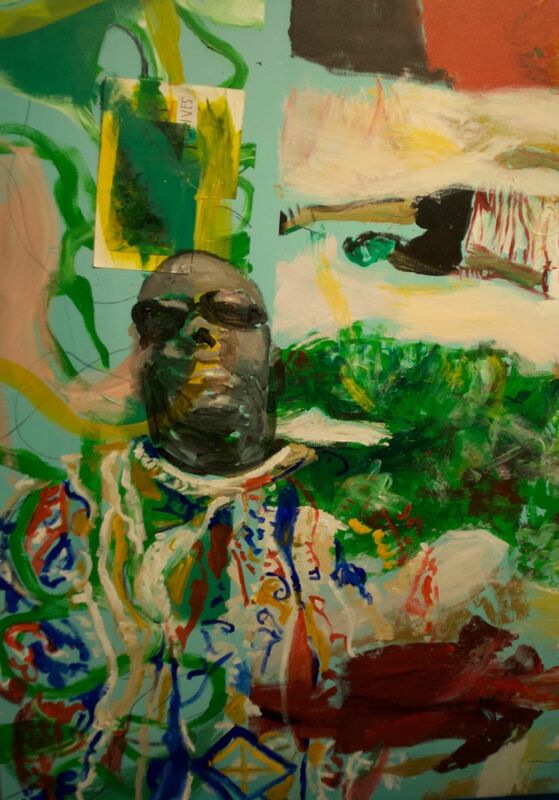 Quigley added last minute a portrait of George Latore Wallace, aka NOTORIOUS B.I.G. wearing a signature Coogi Sweater, to further emphasize how the powerful messages behind Art, Music, and Culture can impact and inspire society when focused on the positive. Dan Meeks Crating the Paintings. Started in 2012 commenting on a collector, Carl Price and his wife Christy's Collie Coco, who coincidentally had the same name of Quigley's friend Jeffrey Bandman's little dog Coco. "Everytime I would go over to either Jeff or Carl's I'd hear someone asking 'Where's Coco?' I loved both dogs so thought I'd make a painting about them." The Basquiat poster was given to William on his birthday, April 29, 1988 by Jean Michel, who signed it Vrej, joking on the dealer Vrej Bahoomian. William carried it around for about 10 hours that night in NY. From the opening to dinner, to drinks then 3 nightclubs, nearly tossing it in the trash on several occasions. When the entourage arrived at the Night Club The Palladium, Quigley got lost in the crowd. The doorman agreed to let him in if he gave the poster as a token gift for the entry. Quigley refused, and luckily a group in his party came out to retrieve him as he continued to dance and carry it around all evening. The poster has blessed every studio Quigley has painted in since. Hanging like an alter in NY, LA, Boston, and East Hampton as a homage to that night and the short, but lasting impression and relationship the two artists shared from 1986-to August 1988.